Manufacturing processes often involve lifting activities. Crane scales, load cells, dynamometers and hanging scales enable the lifting stages to be utilized for weighing the lifted loads, instead of taking them to be weighed separately. Utilizing the lifting stage for two different goals increases efficiency during manufacturing processes. 1. When cutting steel rolls, the raw material is lifted and carried to the cutting machine. Overhead crane scales and hanging scales enable the rolls to be weighed before and after they are cut. The information obtained is important for both manufacturing and inventory management and illustrates the utilization of existing processes for improved efficiency. 2. 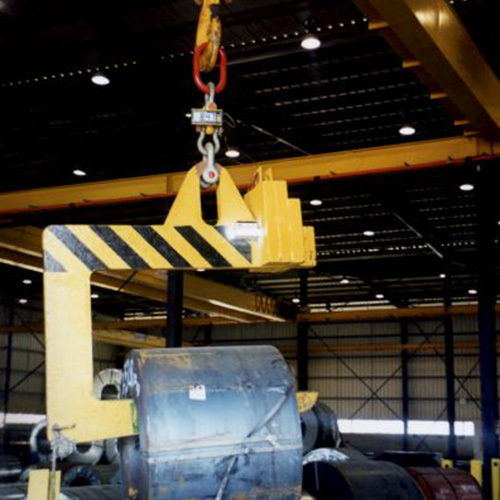 Crane scales and hanging scales are used for overhead weighing of incoming raw materials during the reception stage. When the raw materials are lifted and unloaded, the lifting stage is also used for weighing. The weighing process helps to verify suppliers' reports as well as improving inventory management. 3. In addition to all the above benefits of cost reduction and improved efficiency, Ron Crane Scales, Dynamometers and hanging scales enhance safety as they help to detect and prevent dangerous overload situations. Data communication output (RS-232) enables integration of the data received into the factory's logistics database. Large displays enable convenient and safe reading of the results even in harsh manufacturing conditions.